Here’s a lovely way to “pop the question” to your matron of honour – a card with a lovely message plus deluxe coloured envelope (currently blue). 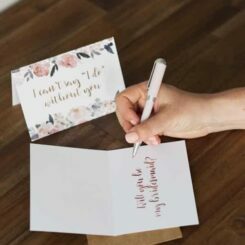 There’s plenty of room for writing a lovely note to mark the occasion – or leave it blank and allow the card to do the talking. Scroll further down to learn about what’s included. Thinking about how to pop the question to your Matron of Honour? Why not with one of these gorgeous cards with deluxe coloured envelope (colour currently blue). On the outside of this card the text reads “I can’t say I do without you”. On the inside, it “Will you be my Matron of Honour”.